If you're travelling in a large group or looking for a day out with friends or colleagues, this day trip near Delhi is the perfect option. 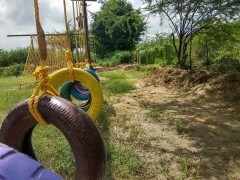 You'll drive down to this campsite, surrounded by the Aravalli hills, where you can breathe the fresh air, try your hand at adventure activities, eat a delicious lunch, and do some team games. 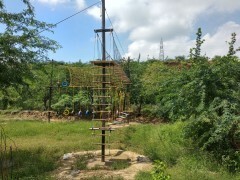 Adventure activities here include the Tarzan Swing, commando net, Burma Bridge, as well as archery, cricket, football, and more. This campsite is located only 35 kms from Gurgaon, in Mangar village. It is surrounded by the Aravalli Hills and has farms and greenery nearby. On camp, you'll have facilities for adventure sports and fun activities. There is a spacious dining area, and washrooms for your convenience. • Book a corporate retreat, group trip or day picnic near Delhi. • Enjoy a day out in the middle of nature. 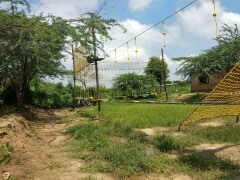 • Try your hand at activities like Tarzan Swing, commando net, archery, etc. • Eat delicious meals at a fresh air dining area. This is not a challenging trip, but if there are some adventure activities on camp. If you have any cardiac or respiratory conditions, or suffer from knee or spinal problems, please consult your doctor before attempting the activities. Please avoid littering or defacing any property on campsite. Participants must follow the instructions of the guides during the adventure activities. Those failing to do so will be asked to leave, without refund. Please adhere to the rules of the camp at all times and respect the other guests here. Anyone found causing nuisance to other guests will be asked to leave. There will be no refunds in this case. There will be no refunds in case of cancellations, but you may carry your reservation forward as per the terms below. For cancellations of this day trip made 15 days or more before check-in date: You may reschedule the booking for another date in the next three months. This will be subject to availability, and any additional charges for weekend/festival/public holiday rates will be payable. For cancellations made 0-15 days before check-in date: No refund or rescheduling. No shows: No refunds or rescheduling. No refunds will be given for unused services or activities. The costs do not include any additional expenses incurred due to bad weather, road blocks, medical emergencies, illness or injury, etc. Any personal staff like drivers, nannies, etc will be charged INR 250 for meals only during day trip. You will have to purchase a liquor license if you plan to consume alcohol on this trip. This will cost approximately INR 12,500 per day. Children below 6 years may stay for free. Children aged 6 and above will be charged as adults. They may not be able to participate in all activities, depending on age/height restrictions for each activity. There is no pick-up for this camping trip near Delhi. There is no drop-off for this camping trip near Delhi. Your day starts at 09:00 hrs, so do make sure you're on time. You'll be served a delicious breakfast of aloo poori, veg sandwiches, and tea or coffee. After that, the day is yours to enjoy. You can try the activities on camp, only stopping for lunch by noon. After lunch, when the sun is too hot, try out some indoor games or relax with your friends in the fresh environs. After evening tea with cookies, you can take a walk or enjoy the rest of the games. Check-out time is 18:00 hrs, and you'll be back home in Delhi shortly after that. • Please carry specific personal or prescribed medication, personal first-aid kit for this adventure trip near Delhi. You will be served a breakfast of aloo puri, veg sandwiches, and tea/coffee in the morning. At lunch time, a buffet lunch of veg and non-veg options will be served. At tea-time, you will be served tea with cookies. You will spend the day at the campsite, with access to the washrooms and dining area for your convenience. You'll be checking out by 18:00 hrs. The campsite is located in Mangar village, Dhauj, Haryana. 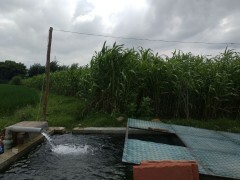 This is about 35 kms from Gurgaon and can be reached by car.